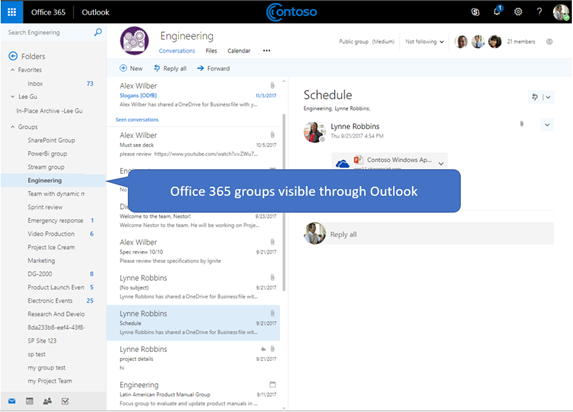 Office 365 groups provide the foundational membership service for users to share conversations, files, notes, calendars, plans, and many other assets. Why integrate with Office 365 groups? Groups form the foundation that enables user collaboration and integration across services to support rich scenarios in task planning, teamwork, education, and more. When you integrate with Office 365 groups, your application can support millions of users as they transition across various experiences in the Office 365 suite and beyond. Use the Create group API to provision a new group. The group is then made available in a range of applications, such as Outlook, SharePoint, Microsoft Teams, Planner, and even Microsoft Stream. Microsoft Graph synchronizes across these connected services to seamlessly provide access to all group members. Enable members to indicate that a group is one of their favorites, or remove it from their favorites if they choose. Create, get, or delete group conversations from your custom application. Schedule calendar events on the group calendar. Get information about the SharePoint site that's associated with a group, such as the document library lists or subsites. Create a plan in Planner that is owned by a group. The plan provides a visual way to track teamwork by allowing you to create tasks that can be organized across buckets. Access the OneNote notebook associated with a group, which can be used for collecting meeting notes and organizing ideas. Enable a group for Microsoft Teams (preview) to allow group members to engage in persistent chat. Delete groups. When a group is deleted, all associated content is also deleted, which prevents orphaned sites, conversations, or plans. Add and remove members from an existing group. Get a list of owners or a list of members for a group. This helps communicate who has access to group content, or who might need to perform administrative duties, such as renewing the group or approving a join request. Designate groups as Public, where group content is visible to anyone in the same organization, or Private, where group content is only visible to members, via the update group operation. Remove owners who are no longer participating in the ownership responsibilities for a particular group from the list of group owners. Configure a broad range of group policy settings that help define behaviors, such as automatically deleting groups unless they are renewed by an owner and enforcing naming policies on Office 365 groups. Renew groups that are about to expire to allow team members to continue with collaboration and accessing content. If the group is not renewed according to the established expiration policy, the group is automatically deleted. Try out some sample API requests in the Graph Explorer. Learn more about how to use the groups API in Microsoft Graph.